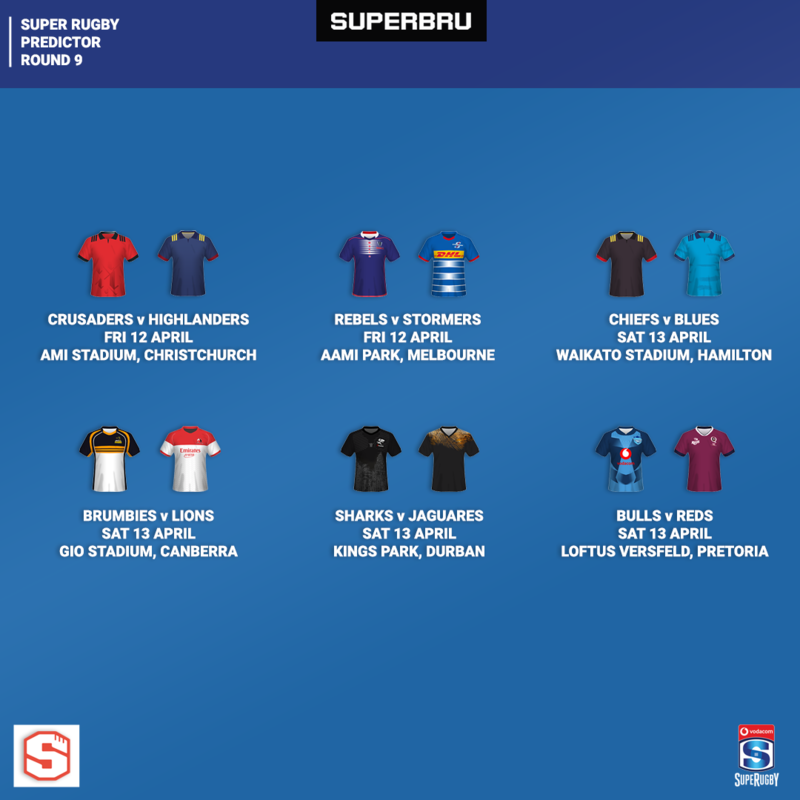 Super Rugby Round Nine Predictions! I missed all of last weekend's Super Rugby action as a result of being away on holiday with my family - normally I'm able to watch at least 2 or 3 matches per round, which is way more than any other Rugby. With three young kids, the early morning kick-offs here in the UK work quite well for me! I had four correct picks out out of seven last week, matching the community average by predicting all the obvious ones and none of the upsets, as the Reds beat the Stormers (predicted by 37%), the Sharks thrashed the Lions (14%) and the Jaguares shocked the understrength Bulls (6%). Well done to Belinda Glenn who had an impressive GSP to take the Yellow Cap in my 'Challenge Hutch' pool last weekend. James Slater remains top of the pool so he's the man we're looking to catch up with this week. So that's five home wins out of six - which ones do you disagree with? Bulls and Lions games I disagree. I'm going for the Aussies there. I think Reds are much better then you rate them. Hi, my differ to Hutch.... Brumbies to beat lions.... Blues to beat chiefs... Good luck bru's. The Lions will do better than the Stormers overseas. Stormers will lose 4 of their overseas games and the Lions will lose only 3. I'm with you this week Hutch, although I reckon you are under shooting on some of the margins ( Rebels Chiefs Lions and Sharks ) Only possible upset I see is the Brumbies coming out firing at home but I doubt it. Who knows maybe we can pinch a grand slam, good luck everyone! Hagar go this week Bull to beat the Reds -4.5 The Blues to beat the Chiefs by+4.5 and your Sharks -7.5 against the Jaguar's. This was my hardest decision, in my Fantasy I went for Am instead of Kerevi( who I think is Fantastic) and Mapimpi instead of Hodge. Hopefully the Sharks swim in! Wouldn't see Brumbies beating Lions as an upset and the NZ TAB agrees with me making the Brumbies $1.51 favourites. You say "home team normally wins" between Reds and Bulls, actually the last away win in that clash was 2004 (so you're correct but fail to get across the extent of home dominance). I've picked the Blues to edge the Chiefs.